Do you remember this item: Smoant Battlestar Mini, today, I will introduce the twins for you, can you tell us the differences about these two mods? 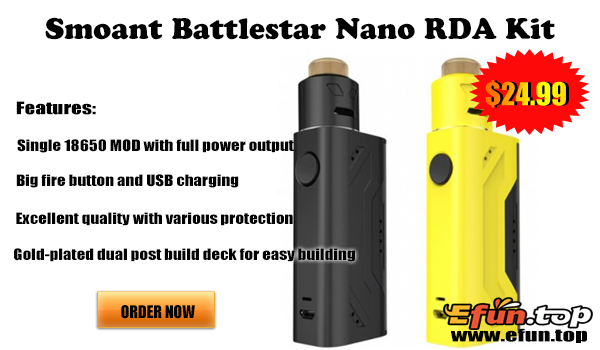 Smoant Battlestar Nano Kit comes with a Battlestar Nano box MOD and a Battlestar RDA. The Battlestar Nano is a single 18650 MOD with full power 80W output. It has a big fire button and supports USB charging. Its excellent quality and various protections ensure a safer vaping experience. It is sold just only $24.99 on efun.top! Weekend Flash Sale Coupon Code: WFS10 TO Enjoy 10% Off Disount!